Amazing over-ear headphones under $100. Great for accurate bass lovers and music enthusiasts. Audio-Technica ATH-M40x headphones reproduce great bass while remaining balanced and fairly neutral, making them a favorite among musicians and gamers. These aren’t “boomy” or muddy but produce clear and deep bass with a nice punch. The sound is so very good many people think they’re better than the ATH-M50x. May not be immediately comfortable, but breaks-in well. Perhaps the only major downside for the Audio Technica ATH-M40x headphones is the consistent user complaints about initial comfort. If you have a small and medium head size, then these headphones will probably fit really well. If you have a larger head, these headphones could work, but you’ll need to wear them for a few hours before the foam padding conforms to your contours. Once you get a reliable fit that is comfortable, they can be worn for several hours. The over-the-ear headphones have a closed-back design. This means they have quite effective noise isolation. These aren’t active noise-cancelling headphones but do have good passive sound isolation. This design works really well for noise isolation, but it also means that your ears may get hot, especially in warm environments. The earcups and headband material, soft foam, is good quality but may feel a bit hard at first so just be aware of that. If you have larger ears then the headphones may end up resting on the outside of the ear instead of around it. Overall noise isolation is good and there is just enough ambient noise that gets through so you can be aware of your surroundings when you want to. Professional build quality with two common points of failure. These headphones work really well in a studio or office environment. Because of their large and somewhat bulky design, they aren’t the best for compact traveling needs. However, the hinge and pivot design allows them to fold up. The plastic hinges on the Audio Technica ATH-M40x headphones are one of the weak points. This is common for many larger headphones, so it isn’t a big deal. One of the only significant points of failure is that the copper-clad aluminum wire connecting the two ear cup drivers can be damaged from a lot of bending or adjustment. Thankfully, the wires are detachable so you can always get a replacement. You can even get a Bluetooth adapter and make these into Bluetooth headphones. Most users will find that these closed-back headphones have overall great, robust construction with only a few minor drawbacks that can be avoided if you take care of them. Pivoting ear cups and quality detachable cables are a big plus. Audio-Technica ATH-M40x studio headphones come with two detachable cable options that connect to the left ear cup. 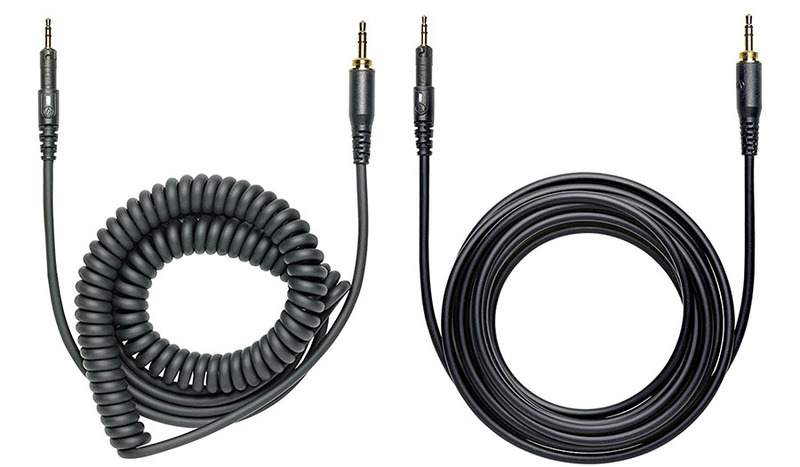 The coiled cable measures 4-10 feet (1.2-3 meters) and the straight cable is 10 feet (3 meters). The cable jack connection is a twist-lock design that is very secure and won’t accidentally unplug. 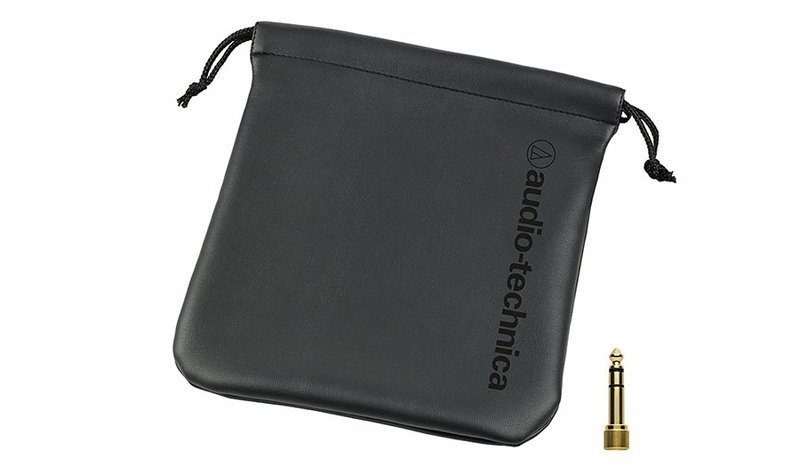 A quality screw-on ¼” adapter is included, along with a soft drawstring pouch. The ear cups can pivot a full 90˚, which makes these headphones popular for DJs. 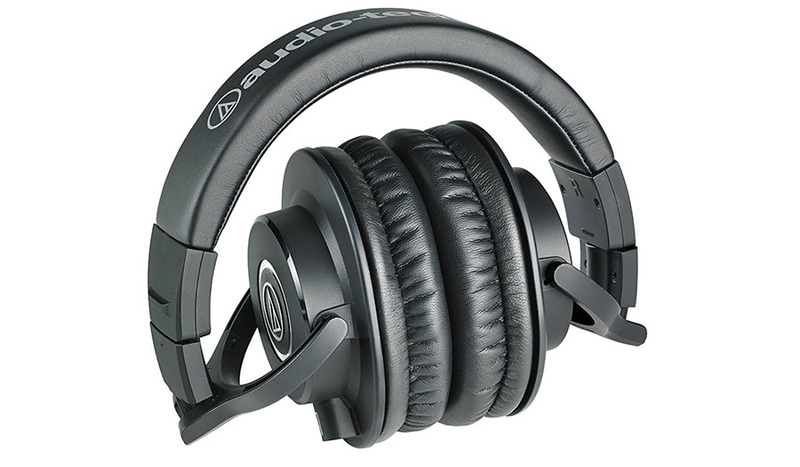 Audio-Technica also makes a separate Bluetooth adapter/amplifier (BAL-M40x) that can be used to quickly convert these wired headphones to wireless operation. Strong and powerful sound that is accurate and nearly neutral. There are other large format headphones with bigger drivers that can produce some powerful bass, but the 40mm drivers in the ATH-M40x are impressive. Sound quality is superb especially considering the price. The accurate audio is also the reason why many people use them as DJ monitoring headphones or as professional studio monitor headphones. Audio-Technica has tuned this pair of headphones for a more neutral and flat sound profile, but that doesn’t mean they don’t pump out some serious low end. What makes the Audio Technica ATH-M40x headphones stand out is the balanced approach to frequency reproduction without compromising certain ranges. Lows are nice and strong, yet controlled and even a little bit warm. The blend between highs and mids is very tasteful, and you won’t hear any muddiness in the low-mids like you can with some other professional monitor headphones. Bass lovers will appreciate the attention to solid low-frequency energy and the average music listener will enjoy the natural sound and feel these cans provide. The ATH-M40x aren’t for bassheads looking for overpowering bass, but for those who like more accurate and detailed bass. These, honestly, sound better than their under $100 price tag would suggest. You won’t be disappointed. In this price range it’s hard to find better value for your money. Audio-Technica M40x headphones offer a great bargain for over-ear headphones, producing excellent lows for bass lovers while maintaining a fairly neutral sound signature suitable for just about every musical genre.